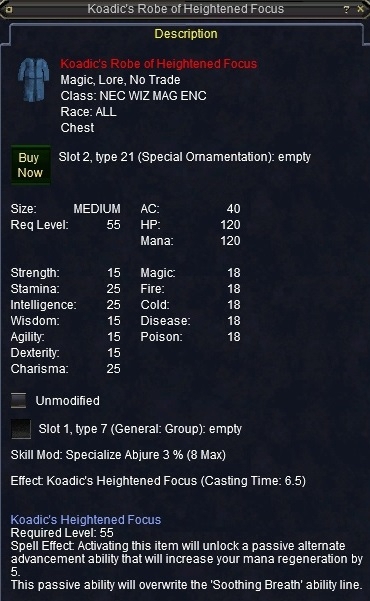 this one has a mana regen clicky so i'd say this one, but if you do already have a mana regen clicky that is the same or better get the vuluk robe. In other words it does stack with Barrier of Force (wiz epic)/Spiritual Dominion (kitty krack), the KEI line, familiar effects, FT, and mana regen AAs, lich/druid wolf form spell effects. IT DOES stack with Seduction of Saryrn(our highest lich). Looted mine tonight tested, stacks, guarenteed. Perhaps I'll be getting a chance of one soon. I checked this effect on lucy and it pretty much stacks w/ everything, Lich, KEI, etc. Only 3 effects are listed as not being stackable, these are other item effects. So every castable buff in the game stacks w/ this. I have to agree with my man Rabizu. /drool. Always use protection. DRUZZIL WILL DIE! YES THE WARRIOR ISN'T REAL!! Does it stack with Lich line of spells? 65 Feral Lord 80 AA's and rising! i would assume so, since the first person I ever saw wearing it was a necro. Since I will probably never see this robe in person, can anyone give a link showing what this looks like? Or better yet submit a shot to the fashion tables here on Alla's so we can all see. Thanks in advance. "Next time, you best bring your kryptonite." Looks like a blue ench poh robe, slightly darker. Excellent job, Triton for the first server wide kill of the toughest mob known on EQ (untill Vex Thall bosses are discovered of course). Don't let those idiots think that your tactics was lame. Those guys are nothing but newbies who pretends to know better. For a random guild, you guys certainly made a name for yourself in EQ world. Also, Congrats to the TWO Triton members won the robes. "Assiduus usus uni rei deditus et ingenium et artem saepe vincit ..."
Emperor fight still requires strategies, whereas VT bosses require a lot less strategy.. This is one of those EQ items that is devastatingly awesome. "It's Time To ... duh-duh,duh-duh ... duh-d-d-d-Duel!" THE ROBE of all robes. All I can say is congratulations to whom ever is wearing it now! Sweet, powerful, and INSANELY AWESOME! Specialize Abjure +3% is very very nice. Finally a way to get your non-primary specializations above the 50 cap. Granted +3% at 50 will only bring your specialize abjure up to 51.5, but hey every little bit counts. Hopefully there will be more items in the future that raise the Specializations. I beleive this and the other drops off the emperor all recieved substantial upgrades just recently all the saves are now 18, the mana and ahp are +120,INT CHA and STA are +25 and all the other stats are now +15. Oh and now the Effect stacks with C3, Wiz Epic, PoTG, etc etc. Somehow I doubt this, considering this screen shot was taken 2 days ago when Triton ganked the Emporer. They said they couldn't fix code in the last patch, and people were screaming that the effect *didn't* stack. Stats may have been stealth upgraded, I'll grat that. Could someone from Triton make a comment? Well, the thing about spells and spell effects is that most of the effects are in spell data file, which they DID push during the patch. However, some complex stacking issues and other complex effects require code to get around their normal stacking rules. Apparently, this was not a complex issue and was resolved by changing something in the spell data file.